The Hackbright Summer 2015 engineering fellows toured the Neustar office in San Francisco on Tuesday, August 25. Special thanks to Hackbright alumna and Neustar data scientist Julie Hollek (pictured, below) for organizing and leading the field trip for Hackbright! We started with Steve Linde (pictured), Neustar VP of Engineering, who talked about what Neustar does – information services & analysis. Neustar CSO/CIO Mark Tonnenson spoke about the different opportunities that are available in tech in general, and Neustar in particular. The panel discussion highlighted different career paths women took to get to Neustar and what they do in their roles now. While many people see software developer as the ultimate career goal, the skills that are learned through attending a bootcamp are crucial to a variety of other roles. Sonya Berg, a data scientist at Neustar, spoke about how she studied math in college, started grad school, had a kid, and then got her PhD in math. She talked about how she entered the field (lots of interviews, lots of rejection) and that you just need to start doing things. 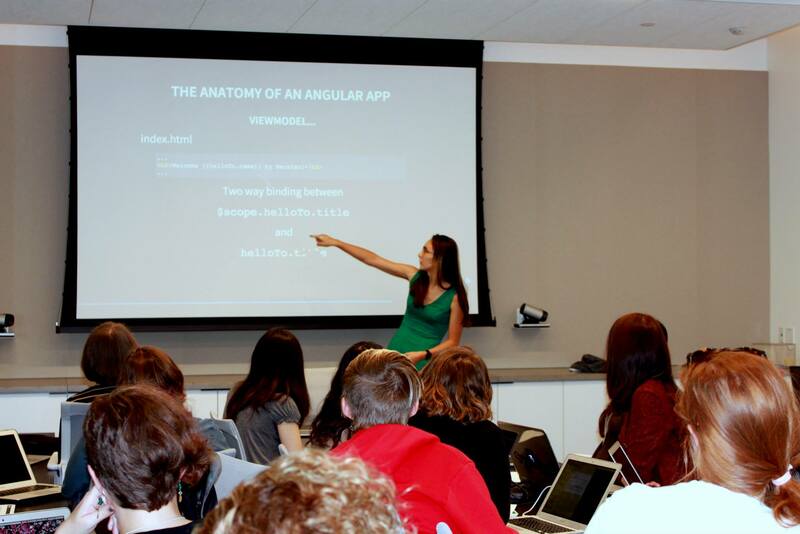 Jennifer Flynn, a software engineer at Neustar, talked about her background (a traditional CS degree). She started her first job doing contract work which helped her solidify what she was interested in. She worked as the programmer for a team in a NASA robotics competition even though she didn’t know anything about robotics (humorously, she stated that in the end, all she needed to know was how to program a while loop). Her team ended up winning. 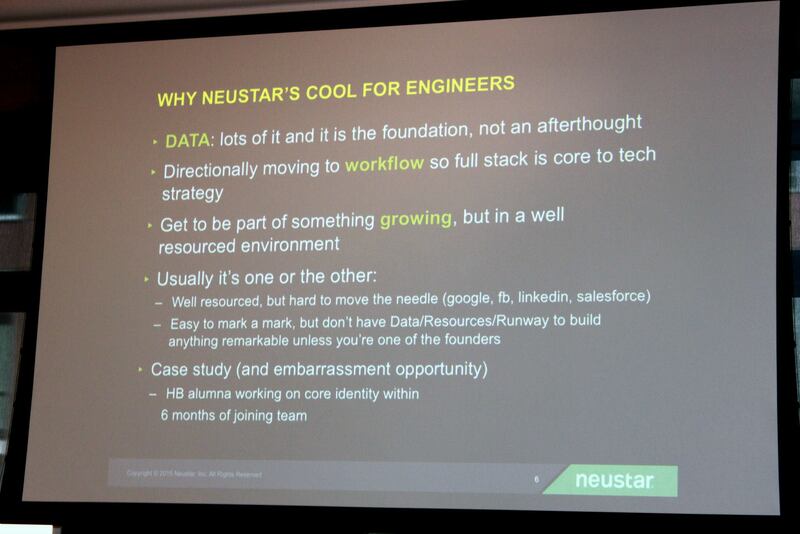 She realized she liked doing data infrastructure and found a good way to do that at Neustar. Her message was to leverage your passions. Amber O’Connell, a data analyst at Neustar, spoke about her background where she previously worked at a startup that did things with maps. The tiny startup folded, unfortunately, as startups sometimes do. And then what she does on a day-to-day basis: provide analytics for the IP Intelligence product. While she’s not a software developer in title, Amber uses Python, Jupyter Notebooks, Pandas, Bokeh, etc. every day. Aileen Chin, a project manager at Neustar, talked about how she started in CS but she moved to business/marketing because her CS classes were 200 people with 2 women in them. She did some retail-ads-finance work but then saw an ad for a an assistant PM role and decided to take a leap. She works with clients, internal stake holders, she comes up with product requirements that then get built and given to clients. Being a PM is cross-functional: Need to be able to talk to sales and the clients but also with engineerings and how to get things done. Having technical knowledge is really important. She learned Tableau and SQL to help her in her role. 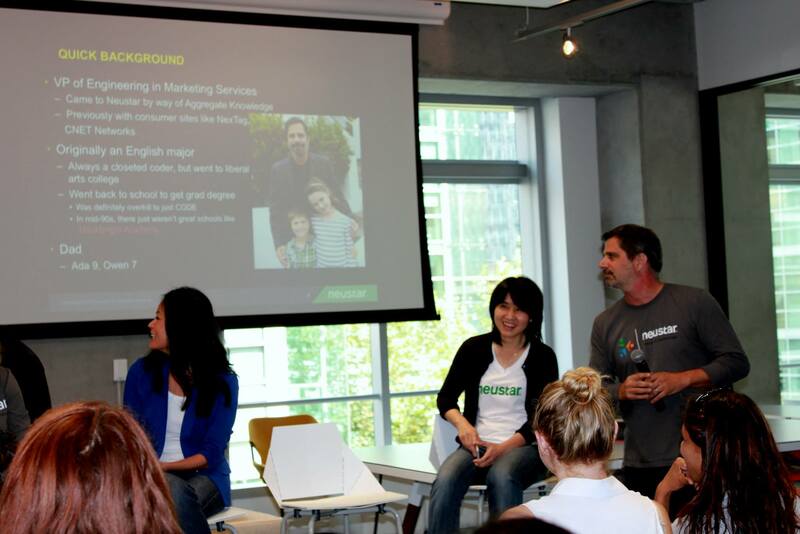 Thanks again to the folks at Neustar for welcoming us to their SOMA office! Special thanks to Julie Hollek for hosting! Julie is also a big part of the Neustar Women in Tech (WIT) group, an organization to provide support and advancement for the women technologists of Neustar and the greater technical community. Neustar WIT hosts knowledge share events, provides networking opportunities, and works with external groups that are promoting diversity and inclusion in tech to promote the goals of advancement, community, and outreach. Pictured above: the living wall in Neustar’s lobby at 505 Howard Street.